"Founder of the Feast - Mr. Scrooge." What’s it about... this is the 40th anniversary production of Charles Dickens A Christmas Carol at the Goodman Theatre, adapted by Tom Creamer and directed by Henry Wishcamper about the life and times of Ebenezer Scrooge and the very special Christmas eve journey he takes with three spirits who show him the errors of his way and a path to salvation. Why You Should Go... Larry Yando is brilliant as Scrooge, transforming from miser to free spirit in a masterful performance. Ron Rains is a perfect fit for Bob Cratchit and steller turns by Ali Burch (Frida), Molly Brennan (Ghost of Christmas Past), a chilling Joe Foust as Jacob Marley, and Lisa Gaye Dixon (Ghost of Christmas Present) stand out in the sterling supporting cast. Who to Watch and Wait For... Paris Strickland makes a very moving debut as the first female Tiny Tim... the entertaining party scenes with your hosts, Penelope Walker(Mrs. Fezziwig) and Jonah D. Winston(Mr. Fezziwig). Music and Merriment is Everywhere especially in the strolling musical transitions provided by Justin Amolsch, Andrew Coil, Greg Hirte and Malcolm Ruhl. With one of the most impressive scenic and lighting displays you will ever see, this high-flying show is a surefire, whimsical adventure. A Holiday Tradition... there is something very satisfying about returning to the Goodman Theatre during the holidays. For the young at heart, who may be experiencing Scrooge for the first time, it is a truly magical evening. For the rest of us, it is a chance to escape to another time and be reminded that, no matter what, we can all change for the better. A Special Night... the opening night audience was filled with cast and crew members from previous productions in celebration of the 40th anniversary. 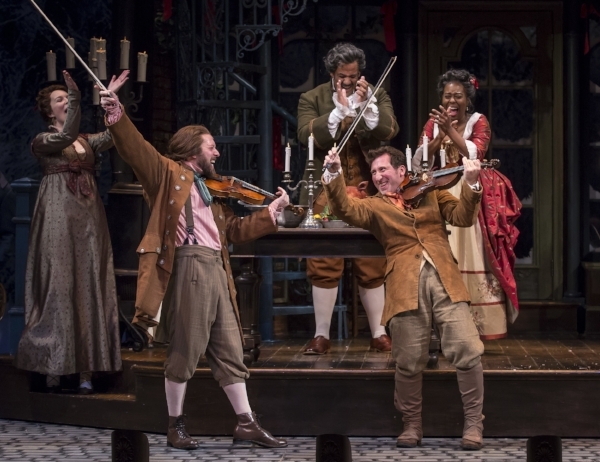 The Goodman Theatre, like others throughout Chicagoland, are now taking donations for Season of Concern, to support those suffering from catastrophic illness. PICKSINSIX Review: It’s A Wonderful Life: Live in Chicago!